For the fourth consecutive time, Digital Guardian has been selected as a “Leader” in the Gartner Magic Quadrant for Enterprise Data Loss Prevention. * Read the 2016 edition now. The all-new, 2017 edition of the Gartner Magic Quadrant for Enterprise Data Loss Prevention is here! Read the report for Gartner's latest analysis of the DLP market. The report was just released today and you can get your complimentary copy here. 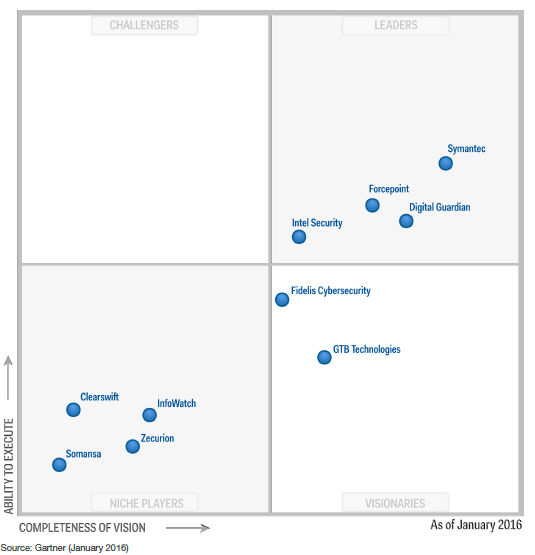 The 2016 Gartner Magic Quadrant for Enterprise Data Loss Prevention. This graphic was published by Gartner, Inc. as part of a larger research document and should be evaluated in the context of the entire document. The Gartner document is available upon request from Digital Guardian. Digital Guardian is very pleased to be named a Leader for the fourth consecutive time. Since the company’s introduction 12 years ago, Digital Guardian has been a leader in preventing data loss, either accidental or from malicious insiders. In February 2015 the Digital Guardian 7.0 Data Protection Platform (DG Platform) became the first solution to combine traditional DLP functionality with advanced threat detection capabilities using the same endpoint agent and the same management console. Combining Data Loss Prevention, Endpoint Detection and Response (EDR) and secure application whitelisting, the DG Platform offers unique data visibility, management and control. It is the first solution in the market that protects intellectual property and customers’ critical data from threats originating both inside and outside the organization. Through its acquisition of Code Green Networks (CGN) in October 2015, Digital Guardian has significantly increased its capabilities by adding network DLP, cloud protection and data discovery. Read the report now to learn more about Digital Guardian and get Gartner’s analysis of the changing dynamics in the data loss prevention market. Source: Gartner, Inc., Magic Quadrant for Enterprise Data Loss Prevention, Brian Reed and Neil Wynne, January 28, 2016. *Digital Guardian was included in previous versions of this report under its former name, Verdasys.